Pokémon Ranger: Guardian Signs is a game I should have reviewed quite a while ago. But every time I saw my DS sitting on my desk or bedside table, I would turn away hoping that by simply ignoring it the game would vanish completely. It isn’t a bad game mind you, just one meant for a slightly younger audience. Of course being interested in the Pokémon franchise in the first place always helps as well. The Ranger series looks and feels a lot like the original Pokémon games, but with one major difference. You’re not a Pokémon Trainer anymore, but a Pokémon Ranger. There are no Pokéballs, and battles play out a whole lot differently. Instead you battle for a Pokémon’s affections. Using the stylus you need to draw circles around the Pokémon using a Capture Styler. Each circle conveys “feelings of friendship” towards the Pokémon. Of course those are just the basics, it soon gets a little more challenging when you throw in several other Pokémon at once, or even the aggressive ones. When circling you can’t touch the Pokémon and their attacks, or it takes off your Styler’s hit points. It does work as a form of gameplay, though it might not be as fulfilling as the old turn-based battles. Plus sitting on the bus you probably look like a real tool, circling furiously on your DS screen — the cons of portable gaming. When you finally do befriend a Pokémon you can use them in further battles, dragging them to the battlefield where they perform one, and only one move. They then need to recharge a little before you can use them again. If you happen to drop the Pokémon in a bad place causing it to have no effect on your potential capture — tough luck. What’s worse is if your Pokemon is injured in battle. It will run away, and no longer be in your collection. Your collection fits up to seven Pokémon at your side. There are no random encounters by walking in long grass. All the Pokémon you can battle are visible on-screen, and you can often walk around them if you have a full Pokémon collection, or if you really can’t be bothered fighting. And once befriended, Pokémon will follow you like a Final Fantasy conga line. You can swap Pokémon out of your collection by winning battles, or by simply just releasing them. 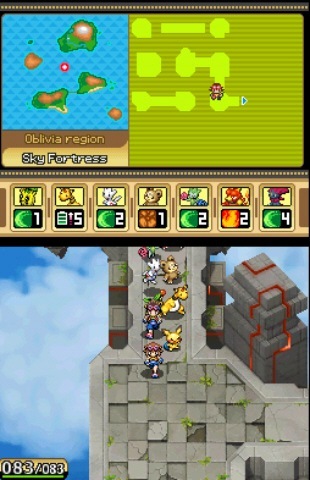 Pokémon can be used for manipulating objects in the environment (e.g. Field Moves — cutting through barriers) like in the traditional Pokémon games. Except once done so they will run away, and often you need to use two or three Pokémon for a single Field Move. For a game that supposedly wants you to be friends with all the Pokémon, it sure does a great job of making you give them up. Forget about levelling them up and having favourites, they are all disposable, apart from your Partner Pokémon – a Pichu. As disappointing as this is I guess it fits in with the lifestyle of a Ranger. After battling Legendary Pokémon, they aren’t added to your collection. Instead you can summon them up at any time by drawing the Pokémon’s symbol with the stylus. The legendaries often lets you ride them to perform environment actions such as sprinting, jumping over gaps, or breaking down barriers. As an RPG it features a decent amount of story and dialogue, but it’s obviously meant for a younger generation. It doesn’t exactly appeal to me as a twenty-something gamer, though I do appreciate the self-referential gestures when the characters critique their own victory poses. Basically it’s about a girl or boy Pokémon Ranger (your choice) who visits the Obliva Region to stop a gang of Pokémon Pinchers from ‘pinching’ Pokémon for their own nefarious purposes. So it’s got quests and side-quests too, having you run backwards and forwards throughout the many islands of the Obliva Region. It is often confusing at times, not knowing where your next quest is. It took me a while to figure out that I needed to find the town name in the quest menu, and then look up the detailed map to find that town. Nothing on the map is highlighted apart from your current position, but in the quest menu it shows a small map with which island the quest is on, and the general whereabouts of the town. There are several minigame-type missions which change things up a bit, requiring you to perform chases, dodging, and stealth etc. Sometimes the game will even ask you to turn the DS vertical. These sorts of missions certainly won’t blow your socks off but they do provide a nice change of pace. Pokémon Ranger: Guardian Signs is a very polished game. For those sick of the traditional format of Pokémon games it might be an interesting take on the franchise. There’s also the inclusion of four-player co-op missions over Wireless. But don’t expect to be enthralled by the game’s story and dialogue — even though it is text-heavy. You may also find the battles getting dull. Don’t go burning your DS cartridge just yet, younger gamers might really enjoy it, providing they have a reasonable reading ability.